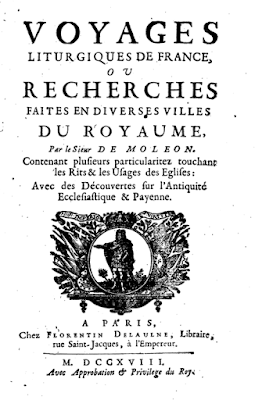 Our good friends over at Canticum Salomonis have recently begun work on a very useful and interesting series of translations from the Voyages Liturgiques of Jean-Baptiste Le Brun des Marettes (1651-1731), also known as the Sieur de Moléon. 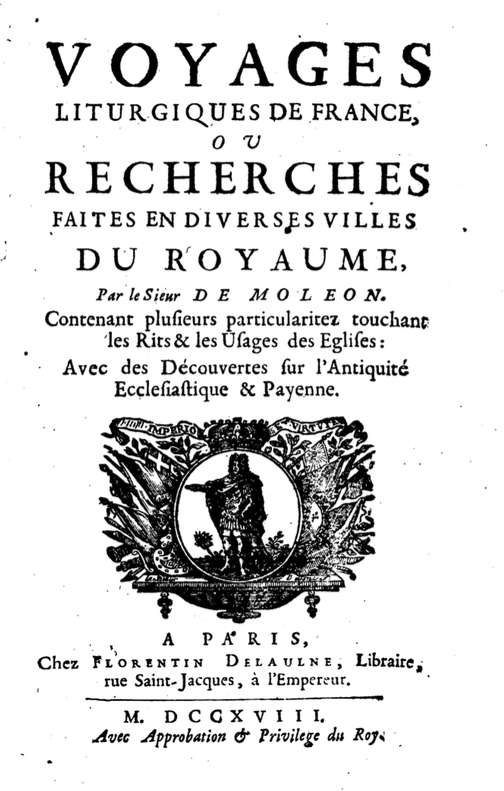 Published in 1718, this book gives a detailed account of the liturgical life of pre-Revolutionary France, based not only on what the author witnessed personally during his extensive travels, but also his consultation of ordinals and other liturgical books in the various churches which he visited. Here is their page of links to the various parts of the series: https://sicutincensum.wordpress.com/liturgical-voyages/; as of this writing, they have done 11 parts on the customs of Rouen, four on the cathedral of St Maurice in Vienne, and one on Chartres, with four parts on Angers forthcoming. As explained in their introduction to the series, on reading these descriptions one immediately notes how important the cathedral and collegiate chapters were for maintaining the fullness of the Church’s liturgical life. Especially in the United States, which has never had a system of chapters, we perhaps forget that until the later part of the 18th century, Catholic lands were still full of such institutions, staffed by both secular and religious clergy; and furthermore, these institutions were provided with the material support necessary for them to dedicate a great deal of time to the regular solemn celebration of the Mass and Divine Office, along with all kinds of processions, devotions, preaching, etc. 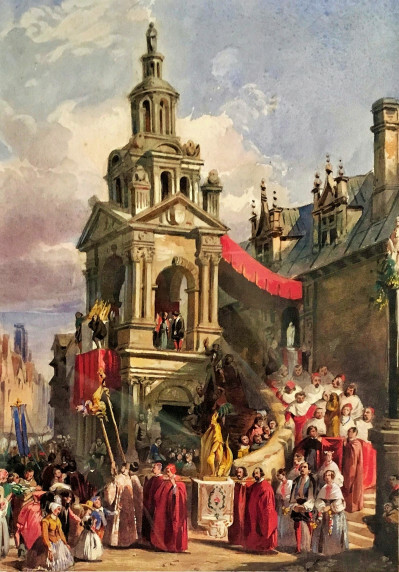 Des Marettes’ writings provide an amazing number of details about these ceremonies and the manner of their celebration; here for example is part of his description of the Rogation procession at Rouen. “On Rogation Monday after Sext, says the Ordinal, they prepare the procession, which the clergy and the people of the city are obliged to attend and do attend, carrying their reliquaries, crosses, and banners. ... While the processions from the other churches are making their way (to the cathedral), the reliquaries of the Saints are taken from the church treasury and placed on the high altar one after the other by two chaplains of the Commune vested in albs. The relics are escorted to the sanctuary enclosure by two choir-boys carrying candles, the deacon and subdeacon with their usual vestments except the tunicle, the officiating hebdomadary or journeyeur also in an alb, stole, and purple maniple, who incenses each reliquary from the treasury until the entrance to the choir, while the cantors sing an antiphon proper to the Saint whose relics are borne. After the antiphon is done, the officiant stops with his ministers, and sings the versicle and collect proper to the saint whose relics are being carried, and places them on the high altar. When all the reliquaries have been placed upon the altar, and the clergy of the city is assembled, the procession begins from the Cathedral church at about 9:30 in the morning, that is to say at the hour when Sext begins. ... First go the reliquaries of three or four parishes with their clergy under their banners, and three or four reliquaries of the Cathedral church with two torches or candles flanking each one. Then follow all the crosses and banners of all the other parishes. ... After (the various ranks of clergy and religious) come two great dragons which the common folk call Gargouilles (similar ones are carried in other churches of France, such as Paris, Lyon, etc.) and which follow the reliquaries (or fiertes, from the Latin feretrum) of Our Lady and St Romanus between players of various musical instruments. The Procession of the Dragon (Procession de la Gargouille) at Rouen, by Clement Boulanger, 1837. A similar custom was observed at Siena, as explained in this article, “How Medieval Christians Celebrated the Rogation Days (with a Dragon)”. It is always much easier to destroy something than to build it, and in the 19th and early 20th centuries, the Church was still very much in a rebuilding phase. No serious person would deny that in many respects, its liturgical life was very lacking, and that the rebuilding of it was in many places going very slowly or not at all. The frustration which many people felt over this made it easy for the more revolutionary liturgists to claim that the problem lay not with the material and social conditions in which the Church found itself at the time, but in the liturgy itself, which therefore needed to be radically changed to accomodate the needs of their favorite imaginary creature, Modern Man™. Having thus diagnosed the problem incorrectly, it was then made much worse by the tremendous haste with which this project was executed.